IT IS Brunei Darussalam’s aspirations to further develop its capabilities in the arena of Islamic finance and realise its vision of becoming a renowned hub for Islamic finance, said Dato Paduka Dr Awang Haji Mohd Amin Liew bin Abdullah, the Deputy Minister of Finance, yesterday. 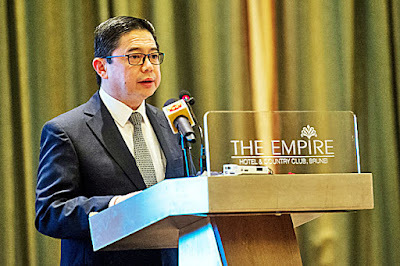 He was delivering the keynote address at the opening of the Islamic Development Bank (IDB)’s ‘Sukuk (Islamic bonds) Model Law’ workshop at The Empire Hotel & Country Club in Jerudong. The workshop is an initiative of the IDB and the Islamic Research and Training Institute (IRTI), with the goal of providing a platform for an exchange of views that could assist in the enabling of a robust legal framework that supports the issuance, regulation and monitoring of Sukuk. “These aspirations are being lauded by His Majesty Sultan Haji Hassanal Bolkiah Mu’izzaddin Waddaulah ibni Al-Marhum Sultan Haji Omar ‘Ali Saifuddien Sa’adul Khairi Waddien, Sultan and Yang Di-Pertuan of Brunei Darussalam,” said Dato Paduka Dr Awang Haji Mohd Amin Liew, in his address. “The Brunei government’s Sukuk Al-Ijarah was introduced in 2006 with the objective of developing the Brunei Government Securities Yield Curve as a benchmark for Corporate Sukuk, and to provide for a safe and liquid investment instrument for domestic financial institutions. The deputy minister added that the recognition of Sukuk as an alternative mode of financing has continued to increase globally. “According to the Sukuk Global Report published by Malaysia International Islamic Financial Centre (MIFC) in 2016, Global Sukuk issuance recorded an encouraging growth of 13.2 per cent from the previous year, amounting to $74.8 billion,” he said. “In the coming years, I am sure that the global primary Sukuk market will continue to grow. Countries such as Malaysia and Indonesia, as well as countries in the Gulf Cooperation Council (GCC), and the Middle East and North Africa (MENA) have continued with active Sukuk securities issuances, and we look forward to seeing more issuances coming from other jurisdictions. Dato Paduka Dr Awang Haji Mohd Amin Liew also said that there are opportunities for domestic institutions to participate in new issuances, as well as in trading activities in the secondary market. “Insya Allah, we will also be looking to issue long-tenure Sukuk in the near future, with the hope of providing the financial market with better benchmarking tools for their products and services and therefore creating a more dynamic and competitive financial sector,” he added. Meanwhile, the Managing Director of Autoriti Monetari Brunei Darussalam (AMBD), Yusof bin Haji Abdul Rahman, said, “Brunei Darussalam sees strong potential that the financial services sector brings towards gearing greater growth momentum. And in ensuring the growth is stable and sustainable against the rising global uncertainty, the foundations of the ecosystem must be dynamic and be able to weather such headwinds. Yusof added, “Upon its introduction in 2006, the Brunei government’s Sukuk Al-Ijarah programme was intended to be one of the means to activate the domestic capital market. The framework that it exists in mostly caters for that purpose. The workshop is organised by AMBD, in collaboration with IDB. Yesterday’s launching was attended by over 100 participants representing regional and international central banks, as well as officers from the local financial industry.